What if our favorite holiday movie characters had access to AT&T, Sprint or Verizon tech help, advice, and guidance? Clark Griswold in “Christmas Vacation” could have avoided the disastrous light display. And the McCallister family from the 1990 film “Home Alone” could have kept their peace of mind and easily located their son. In “Christmas Vacation,” Clark Griswold obsesses over planning the perfect Christmas. 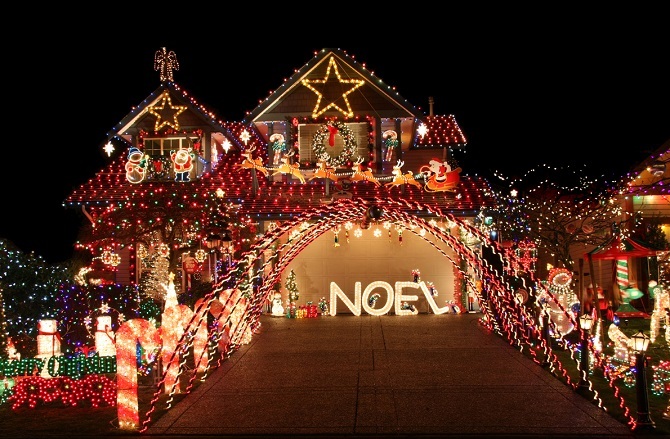 This includes decorating the outside of the house with 25,000 lights and ends with a street wide power outage. The connected solution? Connected LED lights that use about 75 percent less energy and are more convenient to control. These lights could even have saved Clark enough money to surprise his family with the swimming pool. No need for him to stress about the bonus check! In “The Santa Clause,” a 1994 film starring Tim Allen, Scott Calvin rapidly gains weight when he’s doomed to become Santa. How do you plan to control your diet this holiday season? The HAPIfork is a Bluetooth-enabled gadget that monitors your eating pace. Using small vibrations, its sensor signals when you’re “speed eating.” The data syncs with your mobile device using the HAPIfork app for iOS and Android, and can also be connected to other HAPI health-related products like the HAPI Connected Scale, a blood pressure monitor and activity tracker. Could the McCallisters in “Home Alone” have avoided losing Kevin? iOS devices allow you to easily locate friends and family through the Find My Friends app. Whether Kevin was left behind in the suburbs of Chicago, or lost in the streets of New York City, the McCallisters could easily have kept track of Kevin’s whereabouts with this app and compatible iOS device. Buddy in “Elf” carries around a picture of his parents on his quest from the North Pole to find his dad in New York City. Avoid the risk of losing photos with Google PhotoScan. The app, available on iOS and Android, makes it easy to save memories by scanning photos and albums. PhotoScan saves your pictures to Google Photos, which has unlimited storage for anything saved at high resolution. We can you get the most out of your technology. Already a customer? Download the app from your carrier for smarter support at your fingertips.